Suite Sports: Can the Celtics Truly Contend in 2017? Can the Celtics Truly Contend in 2017? We are just 11 months away from the 2017 NBA Finals, and the Celtics could become one of the favorites to the win them in the coming weeks. There have been rumblings from around the league that Blake Griffin and Russell Westbrook could be in green very soon. 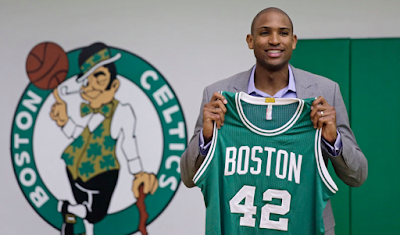 Boston’s current NBA championship odds are the fourth-best in the league, with the only significant move being the replacement of young, lumbering zero-time all-star Jared Sullinger with 30-year-old four-time all-star Al Horford. Horford’s max contract was well deserved, as he showed his health this past season – the Dominican big man started all 92 games, including 10 playoff contests, for the Atlanta Hawks. The reason that the Horford-for-Sullinger swap will make a large impact is illustrated by their respective efficiencies. Among the 80 players in the NBA who started at least 70 games this past season, Horford owned the 19th-best effective field goal percentage (eFG%) while Sullinger was 78th in that category. In terms of true shooting percentage, Horford was 27th, while Sullinger was the worst of those 80 players. In addition, Sullinger did not improve his 3-point percentage from 2014-15 to this past season. Meanwhile, Horford shot 34 percent from deep, a solid percentage in his first season of attempting a large number of 3-pointers. If the Celtics can add five-time all-star Blake Griffin, they would be continuing to add much-needed consistency on the offensive end. Griffin, who is entering his seventh NBA season, is one of just five players who have owned an eFG% of at least 50 percent in 30 or more minutes per game in each of the last six seasons. The rest of the list: LeBron James, Kevin Durant, Chris Paul and Horford. Celtics fans should really enjoy seeing Horford on that list because not only has he produced a career eFG% of 54.3 percent, but he also has not been lower than 52.5 percent since his rookie season when his eFG% was 49.9. Horford and LeBron are the only two players to own an eFG% of at least 52.5 percent in 30 minutes per game in each of the last eight seasons. Health could be something to worry about with Horford, Griffin and Westbrook, but any player not named LeBron James is bound to have an injury bug here and there. Horford has had 11-game and 29-game seasons, but he took more than 1,000 shots last season. Griffin played just 35 regular season games and four playoff contests in 2015-16, but he missed just four games in his first four NBA seasons. Westbrook played every game of his amateur and professional basketball careers until tearing his meniscus in 2013, but he still played 98 of the Thunder’s 100 games this past regular season and playoffs. This past postseason, Westbrook led all players in assist percentage, usage percentage and offensive box plus/minus. In addition, he was named to the 2015-16 All-NBA First Team after making the Second Team in four of the last five seasons. However, even if neither Griffin nor Westbrook come to Boston, the Celtics will still have All-NBA Summer League Second Teamer Jaylen Brown. The Celtics will be all right, and by “all right” I mean arguably the fourth-best team in the league. There will be high expectations, but with how Brad Stevens has dealt with his first three seasons in Boston, those high expectations can be met. For more sports coverage, follow Adam Lowenstein on Twitter at @StatsAdam. Statistics used from Basketball-Reference.com.